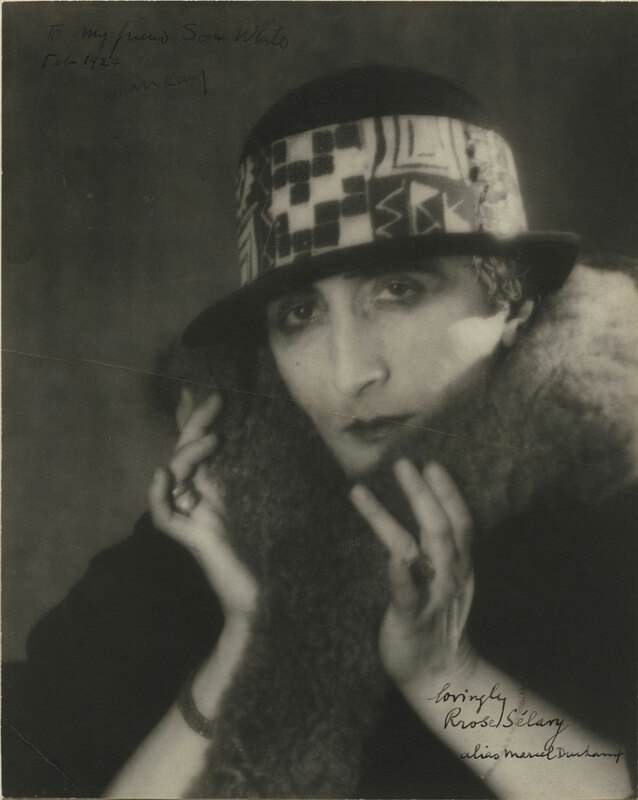 Rrose Sélavy, the feminine alter ego created by Marcel Duchamp, is one of the most complex and pervasive pieces in the enigmatic puzzle of the artist's oeuvre. She first emerged in portraits made by the photographer Man Ray in New York in the early 1920s, when Duchamp and Man Ray were collaborating on a number of conceptual photographic works. Rrose Sélavy lived on as the person to whom Duchamp attributed specific works of art, Readymades, puns, and writings throughout his career. By creating for himself this female persona whose attributes are beauty and eroticism, he deliberately and characteristically complicated the understanding of his ideas and motives. Only a few prints of this photograph are known to exist. This version, inscribed in 1924 by Duchamp to the Philadelphian Samuel S. White 3rd, came to the Museum with White's collection of paintings and drawings. It forms part of the Museum's world-famous holdings of works by Duchamp and is central to a group of Man Ray photographs related to the life and work of Duchamp also owned by the Museum. Martha Chahroudi, from Philadelphia Museum of Art: Handbook of the Collections (1995), p. 241.